EcoMom has the uber-stylish Boon Flair high chair in three different color choices for $179.99. 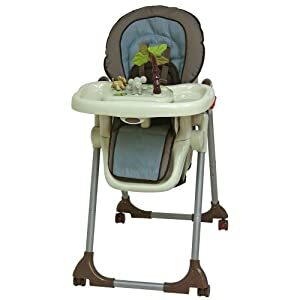 (You'll need to visit the site then click on Daily Deals to find the high chair) Use coupon code NC20 to get 20% off your first order and get this fabulous high chair for $139.10! FedEx shipping is free, too! If you're looking for a simpler, slightly more frugal option, check out the Baby Trend high chair in Skylar. It's $65.66, which is 27% off the list price of $89.99. You'll get free shipping on this one, too!